Tears of empathy flowed copiously for heart broken Chanda, the 12 year old heroine of the South African AIDS film Life, Above All as viewers were gripped by the heartrending film Tuesday morning in the Salle Debussy at the world premiere as an official selection of the 63rd Cannes Film Festival in the Un Certain Regard category. Allan Stratton, 59, the author of Chanda’s Secrets the young adult novel that was adapted for the film Life, Above All said he was already in tears when he saw only the rushes during the filming in South Africa. Allan Stratton (centre) Thato Kgaladi (Soly, the boy) and Mapaseka Matheba (Iris, the girl) on the set of film Life, Above All in South Africa. “I wrote Chanda’s Secrets to put a human face to the Sub-Saharan AIDS pandemic. It’s a visually charged story that reaches audiences of all ages. A film version, created on location by South African director Oliver Schmitz, is a dream come true,” Allan Stratton said. Chanda’s Secrets has won many prizes since 2005, including the Africana Book Award, Michael L. Printz Honor Book award and a finalist for the Prix Sorciere of France and it has been translated into over ten languages. Life above All was directed by Oliver Schmitz, the South African director whose apartheid films Mapantsula and Hijack Stories have also been screened at the Cannes in 1988 and 2001. 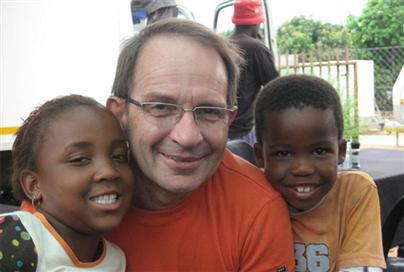 “I think Allan Stratton found a very good way of showing the impact of AIDS in South Africa,” said Schmitz. The author said he spent a month in Botswana to research for the facts. Chanda’s Secrets was produced by German filmmaker Oliver Stoltz whose chance meeting with Allan Stratton during a reading tour in Germany in 2005 led to the film adaptation of the novel.